Today, Keith & Tex can hardly handle all booking requests, from Japan to Germany. “Same Old Story“ will make sure that they don’t get bored on tour. The title tune, as well as “Goodbye Love“ feat. Bunny Brown, are perfect additions to their set of evergreens. More reasons to look forward to many more shows to come. It’s been 20 years since ROBERTO “El Scientist” Sanchez set up A-Lone Productions; masterful and classic works originating from his musical outpost in Cueto, Spain-year after year. Mr.Sanchez and heartical crew are celebrating this milestone with a slew of impeccable works. Consider the just released Ines Pardo showcase set and KEITH & TEX’s, “SAME OLD STORY”. This producer/engineer/musician/studio-label owner has envisioned working with the Rocksteady legends for years and the fully realized results are simply amazing! The ability to capture the sound of an era with total respect and authenticity is in full effect. Keith & Tex recreate the sounds of the 60s on new album. If you were looking for the the rocksteady album of 2017, look no further! Veteran duo Keith & Tex joined forces with Spanish producer Roberto Sanchez (A-Lone Productions) and that collaboration resulted in 'Same Old Story', a truly excellent long player. Most of the compositions on 'Same Old Story' are brand new, but if some riddims sound somewhat familiar, that's possible: the riddim of 'Goodbye Love' was also used for Alpheus' 'Secret Rendezvous' from his 'Good Prevails' album, and for the riddims of 'Refugees', 'Soul Mate' and 'Promises' Sanchez also recycled from his work with Alpheus ('In Time', 'Keep The Faith' and 'Far Away', all from 'From Creation'). And even though this is rocksteady, Keith and Tex prove they are still with the times with songs like 'Cyber Lover', in which the duo tackle the phenomenon of online dating, or 'Refugees', a beautiful song about the fate of the Syrian refugees and the position the West adopts in the matter. Rocksteady gem! Keith Rowe and Texas Dixon, better known as Keith & Tex, had their greatest hits in the late '60s with hits like "Stop That Train" and "Tonight". Timeless anthems that can be sung throughout the world. Later, it became quiet around the two artists. One (Keith) moved to the United States, the other (Tex) to Canada to pursue an ordinary job. In terms of their own, common music was only once, until one was together again and from 2013 toured. For example, her debut in Europa-stage on 19 October 2013 was legendary. Meanwhile, the two entertainers of the old school are much sought-after guests on various stages worldwide, just so far without a new album in the luggage. Until now! For "Same Old Story", they have teamed up with Spanish producer Roberto Sanchez, Also Alpheus actively supported or together with Bi.Ba the excellent album "Massavana" screwed. 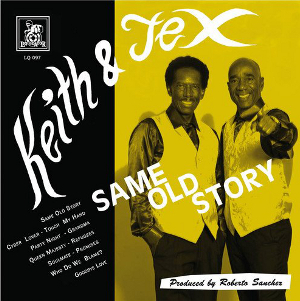 Sanchez contributed the matching Rocksteady-Riddims, some of which were already used at Alpheus, and Keith & Tex delivered 1A. It is about the old well-known stories, which were told already in the Rocksteady era. For example, The (lost) love is high on the agenda. On "Touch My Hand" and "Goodbye Love" they sang, for example, The (respective) ex and spread their heartache. Then, as now, a touching theme. At the same time, the songs sound as if they were directly on the table from the 60s onwards. Timelessly beautiful! "Party Night" and "Grandma" pull the tempo slightly and swing elegantly over to the Ska. Overall, however, the Rocksteady dominates. With "Refugees", they refer to even a position on a very moving subject. "Same Old Story" celebrates the good old days. With the album, the two gentlemen present themselves as fresh as 50 years ago. "Really love the social commentary in your songs on this album (almost HALF the album!)... we desperately need more social living type tunes in these times!!!" Keith & Tex are back with their first new album since their last release in 2015. Collaborating with the talented musician/producer Roberto Sanchez, they have recreated the sounds of the late 60’s with the brand new “Rocksteady” album ‘Same Old Story’. This album features 11 new tracks all written by Keith and Tex and performed by the Lone Ark Riddim Force. This is a CD and Vinyl release on Liquidator Records and continues the excellence that Keith & Tex are known for both on record and in live performances. If you love rocksteady music, if you love great harmonies, this album takes you back to the glory days of Rocksteady. -Jam Splash 2017 at Spade Bar & Lounge in Toronto, Canada on 28 and 29 April, 2017. -Victoria Ska & Reggae Fest XVIII, British Columbia, Canada on June 15, 2017 opening for Booker T.
If an artist wants to revive the spirit of the Rocksteady era at the end of the 60s, then there are two possibilities. They either call Brian Dixon (producer of Western Standard Time, formerly Aggrolites), or join Roberto Sanchez A-Lone Productions) in Spain. Keith & Tex have done the latter, and have come out with eleven tunes that feel as if they have always existed. What is also the fact that some of the classic Rocksteady-Riddims by Sanchez have already been edited for the last album by Alpheus. They are now in songs like "Refugees" and "Cyber ​​Lover", which can hardly be more up to date. With tunes such as "Stop That Train" and "One Night" Keith Rowe and Philip Tex Dixon secured themselves between 1966 and In 1970, they came to the Reggae Olympics, and then the two of them came through the next decades with real jobs in the US and Canada (and without new music) before they went through the festival circus again in 2013. What they missed in the program of hits made them more than make up for their gentle and powerful harmony song. There were no rude Opas on the stage, but charming entertaining gentlemen in the best years. In the meantime, Keith & Tex are hardly coming back with their worldwide festival bookings. The new material from "Same Old Story" will make sure that they do not get bored on tour. The title track or "Goodbye Love" feat. Bunny Brown are the perfect addition to their evergreen program. We look forward to seeing you soon.